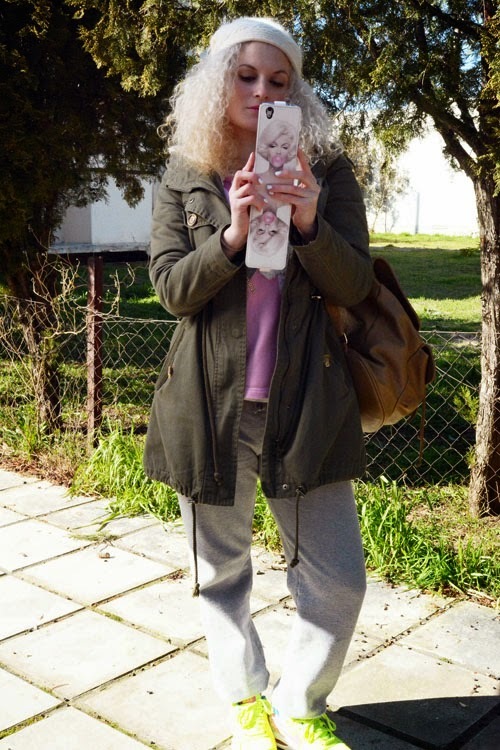 FASHIONIZEIN | by Theano Lazaridou: Put your Nike Air Max on! On the occasion of Nike Air Max day, I thought to wear my own pair and get sporty! Since you would have a hard time describing me as the athletic type, you can see how I am breaking new and exotic grounds with this look! On the other hand who doesn’t like comfortable and cool clothes rather than tight ones or even worse tight shoes? So what’s more comfortable and cozy than a pair of sweats and our trainers? It might not be an everyday outfit, but for a stroll at the beach or a quick run to the shop I think a sporty look* like that is just fine! 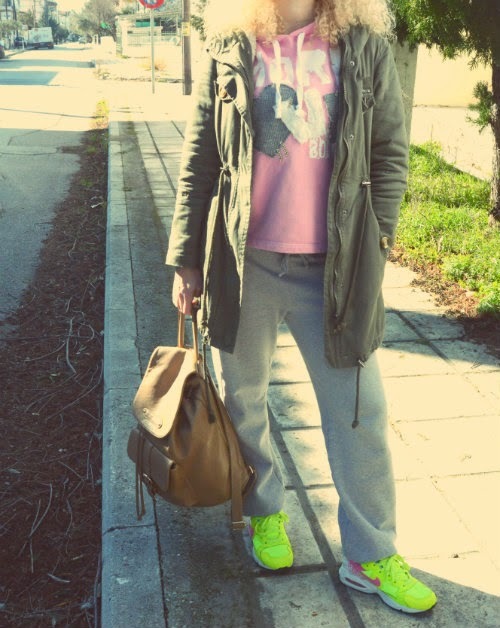 So here is me wearing my grey sweatpants along with this perfect bubblegum pink sweater and of course my favorite colorful, very special and comfy Nike Air Max, ready to go out! The parka and my backpack completed my athletic look! What do you think? Πολύ όμορφο χρώμα τα παπουτσάκια! love that green in your shoes !! oh wow, I like those colors! That outfit rocks! 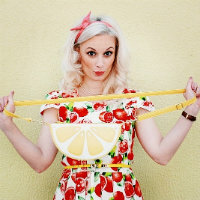 Your looks so great and such a nice outfit! You look so cool and fresh! 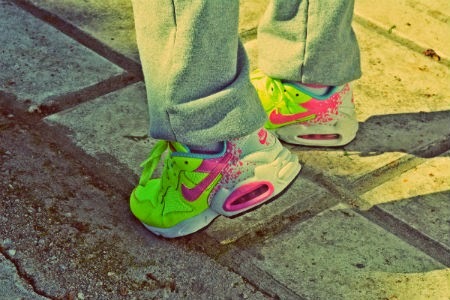 Nike Air Max's are great for any outfit, haha! There's a giveaway on my blog right now, make sure you check it out! 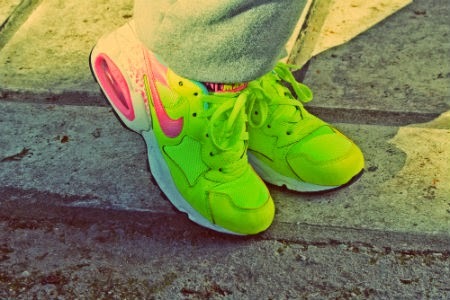 I love the bright colorful shoes! 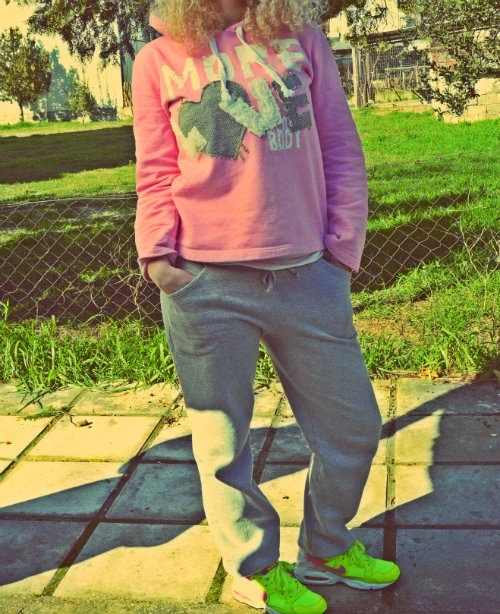 Sporty day, I love Airmax! Such electrifying sneakers! I love what you paired them with.